You asked for it…you’ve got it! 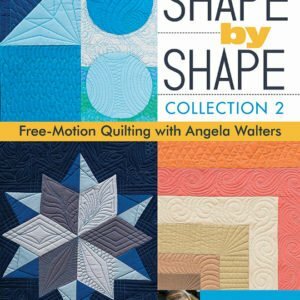 Best-selling author Angela Walters is back with 70+ all-new free-motion designs and variations to take your quilting to the next level. Tackle your quilt top one bite at a time, with ideas for quilting specific shapes—squares, rectangles, triangles, circles, diamonds, and hexagons—plus background fillers and borders. Quilt planning is easier than ever with step-by-step illustrations and detail shots of each motif, plus stunning full-page quilt photos and a handy visual index. Each versatile design is perfect for use with your longarm, midarm, or home sewing machine.